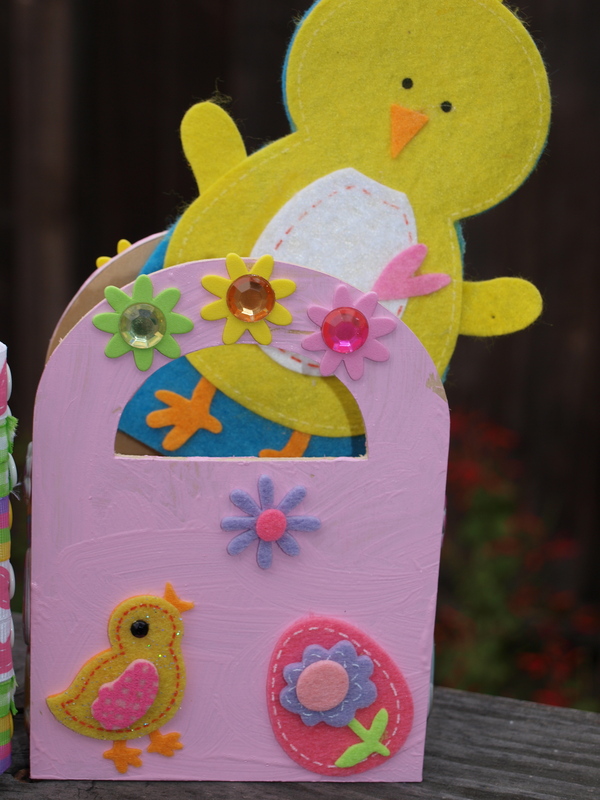 All the cracking, bashing and crunching made these by far and away the most exciting springtime activity for the kids! They make a gorgeous hostess gift, too, and you can make them for any occasion. 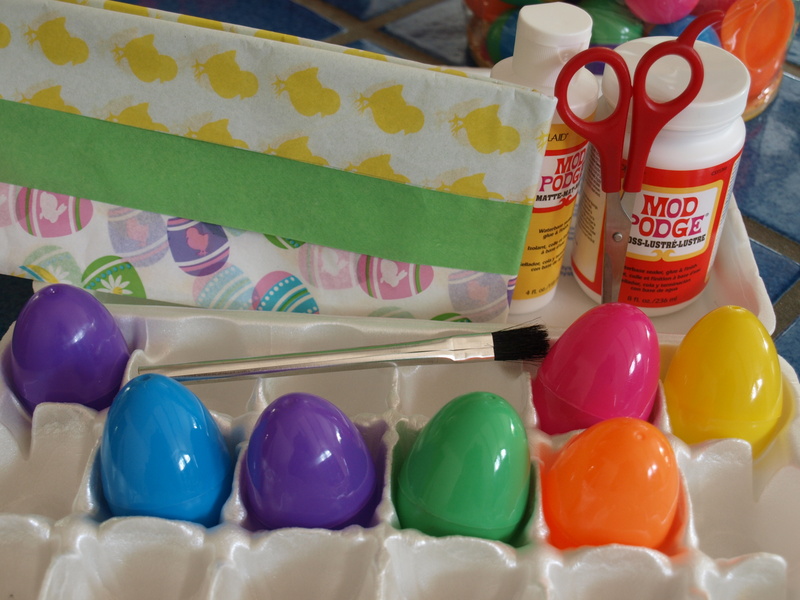 For detailed step-by-step instructions, see not martha‘s excellent tutorial for Easter Surprise Eggs here. 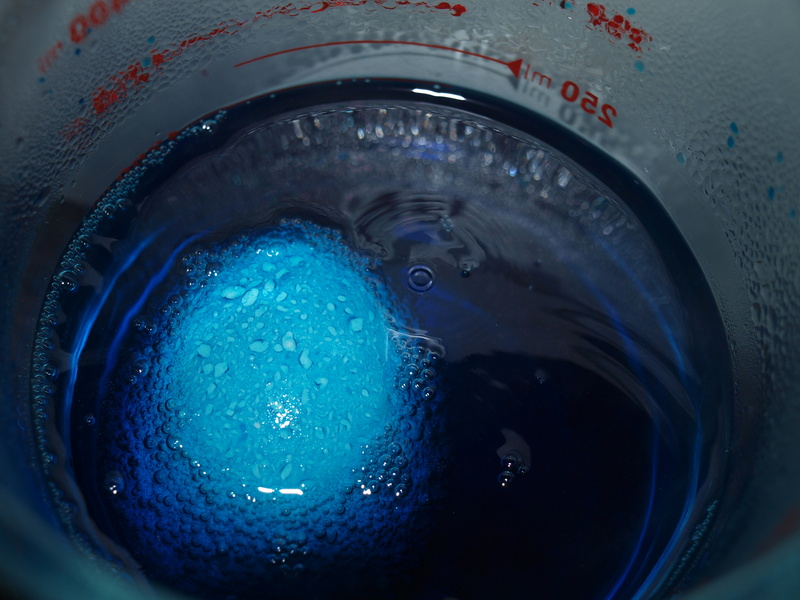 I followed the color recipe exactly because her eggs turned out so strikingly beautiful, but the only recipe that developed into a similar color to hers was the blue – and still it wasn’t quite as robin’s egg/turquoise in color. 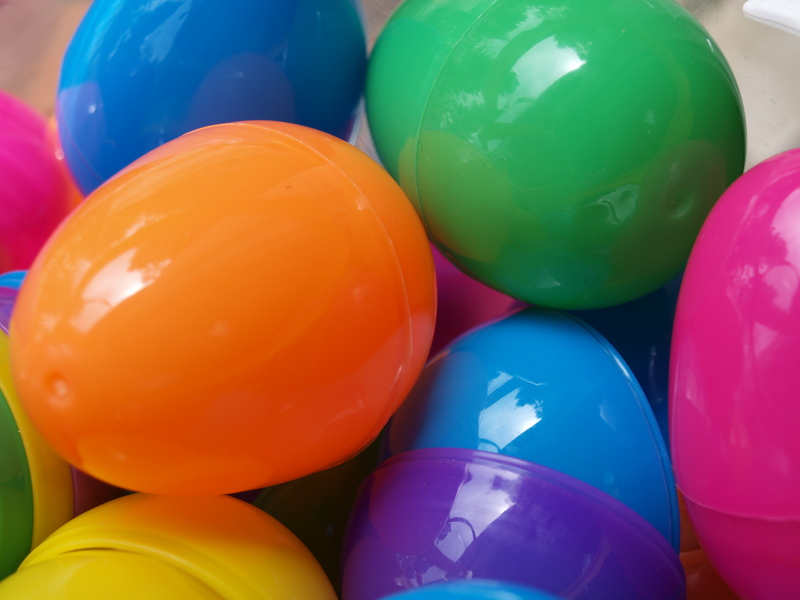 If you agitate the eggs, you’ll get splotchy color, but this isn’t necessarily a bad thing. 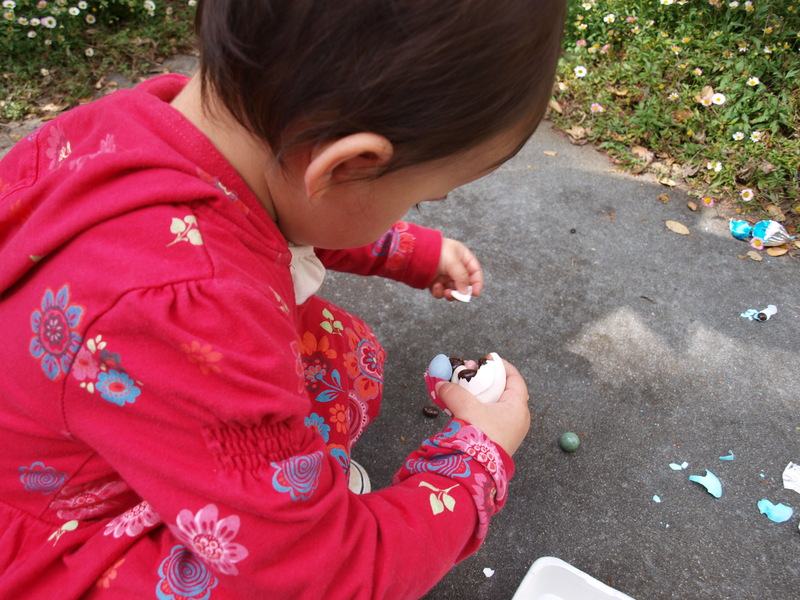 In fact, Hubby and Grandma’s favorite egg was the one that turned out the most speckly. 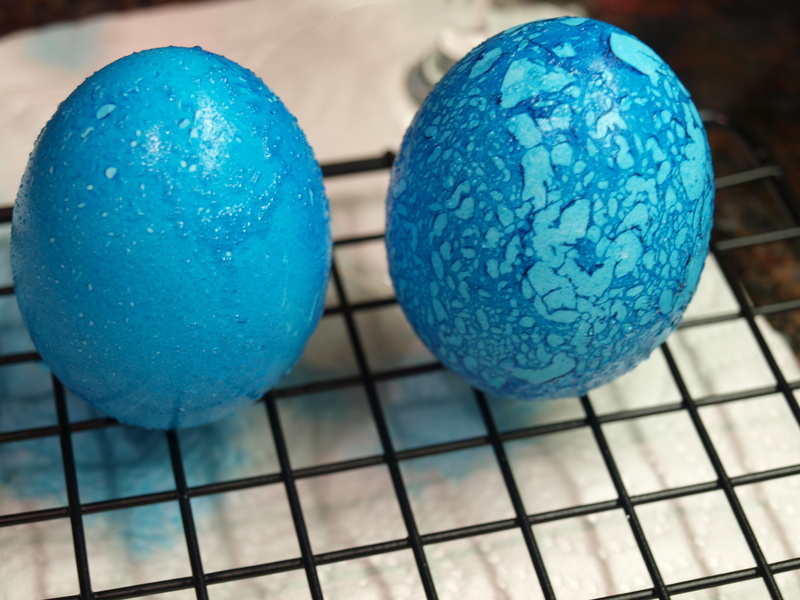 If you use just-boiled water and highly acidic vinegar (like I did), when you drop your egg into the coloring solution, it will spin and fizz like crazy on its own, which creates the speckled effect. 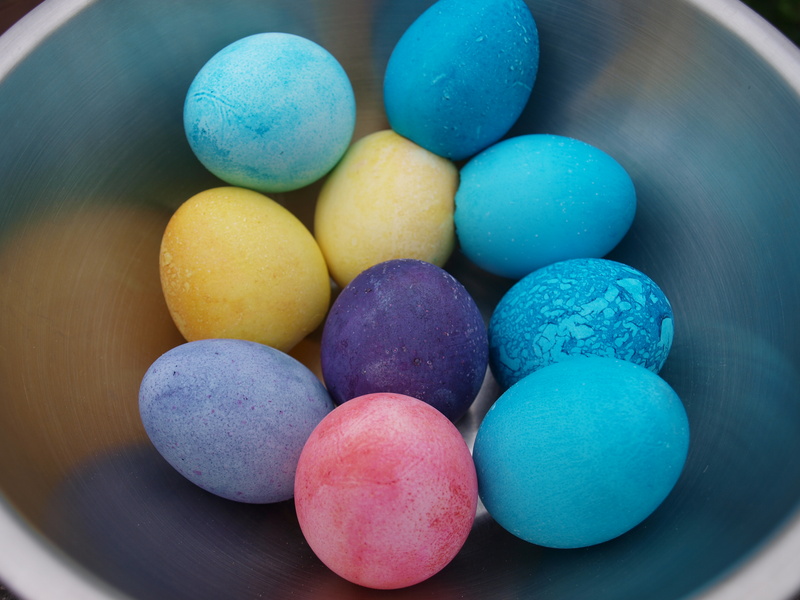 Although most blogs advise not to move your eggs around, I found that dipping the eggs once for an initial coat, and then dipping additional times to increase the color intensity worked better than when I tried the recommended method of letting the eggs sit in the solution and then rotating halfway during the coloring time. 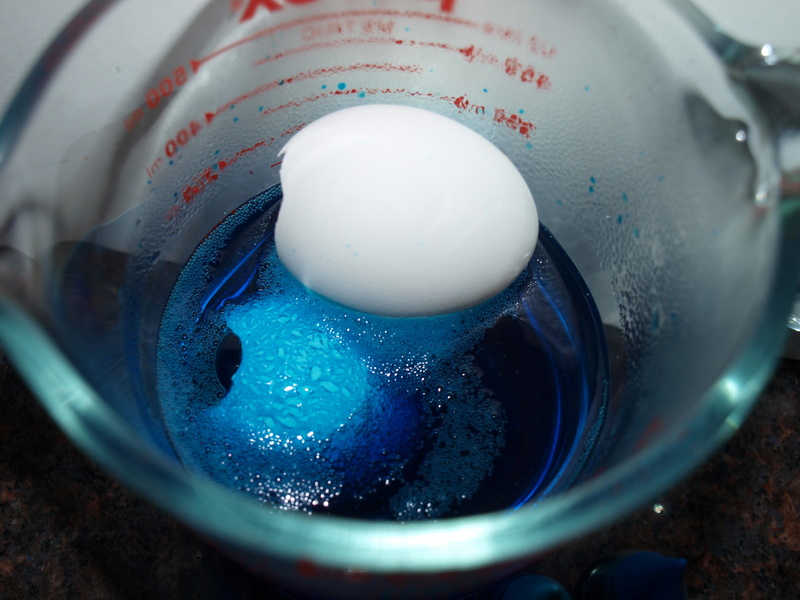 Submerging the entire egg or leaving the egg floating on top of the solution didn’t seem to make a difference (except that if you leave the egg floating on top, you’ll have to rotate four times – quarter turns). When taking the eggs out of the boiling water during sterilization or the just-boiled water for the solution, do not lift the egg out completely vertically so that the boiling hot water drips down on to your finger! Try a more horizontal angle. Try an eggs inside of eggs look. 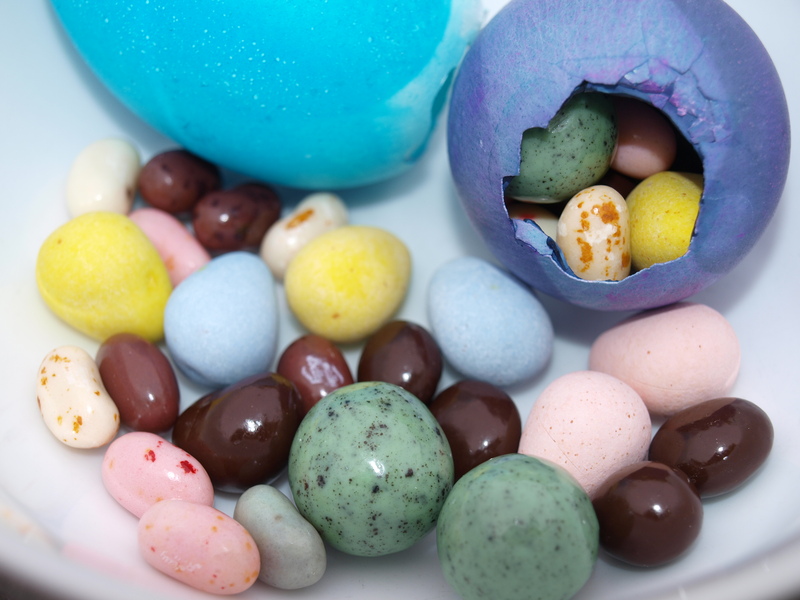 I chose Cadbury Mini Eggs as the main candy, Marich Mint Chip Maltballs to go along with the speckled theme, and Jelly Belly Ice Cream Parlor jelly beans for more of the speckled egg look. Sconza Dark Chocolate Raisins finished out the mix. 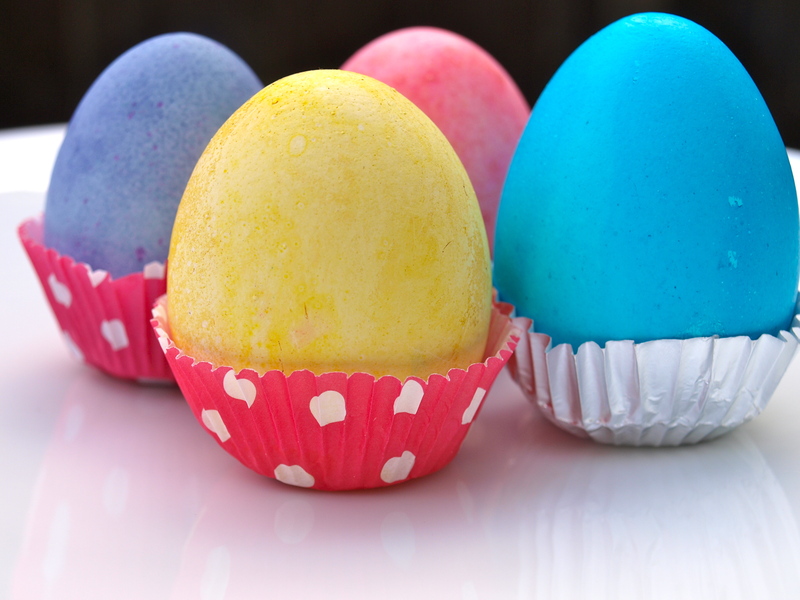 Use mini-cupcake baking cups to seal your eggs. Stickers don’t fold around the jagged opening as well. 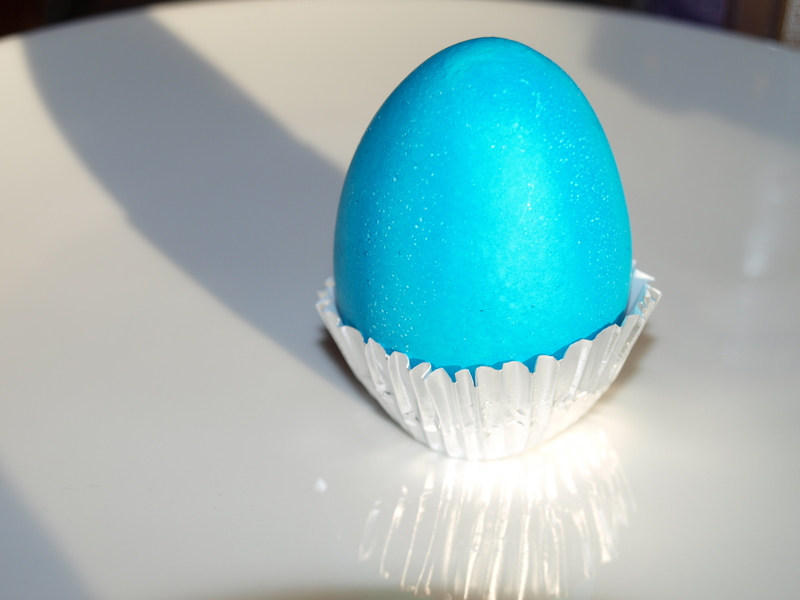 I used polka-dot mini-cupcake paper baking cups for all the colors except the blue eggs, which I sealed with silver foil cups. 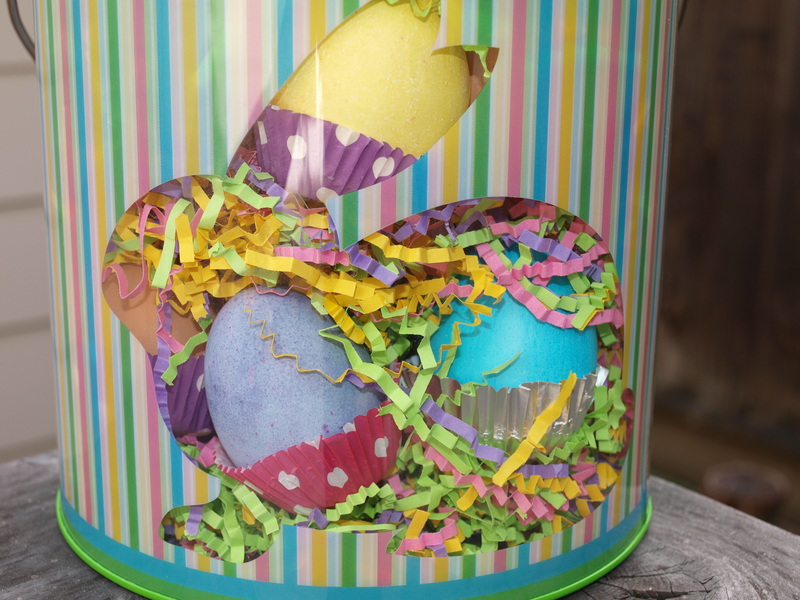 Present the eggs in a clear tin for a pretty and practical way of transporting this gift. 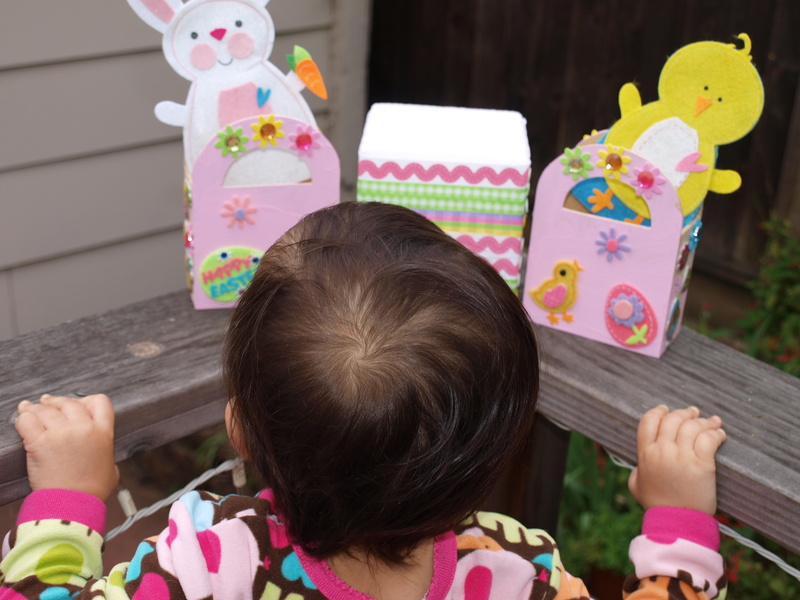 Alternate the eggs with layers of paper Easter grass. I think we’ll be making these for other occasions, too. I see Fourth of July flag eggs, pumpkin eggs, Santa eggs . 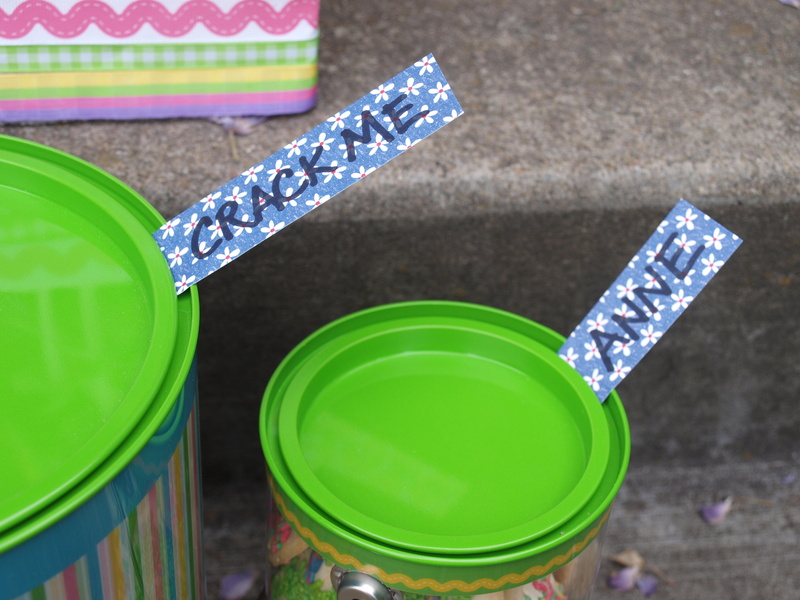 . . the cracking is irresistible fun! I’ve always looked forward to back-to-school sales in early August, which mark the imminent start of the school year ahead. New academic apparel means Halloween – the first official “holiday” of Fall – is around the corner, with Thanksgiving soon to follow, and Christmas rounding out the holiday season in early Winter. This trio of festivities continually make Fall my favorite season with all the crafting, baking and planning involved for each occasion. And of course, Fall wildly surpasses all other fashion seasons. Autumn collections deliver, with bold classics for the serious fashionista. Spring and Summer looks, on the other hand, tend to fall short. They’re so full of – well – frivolous frippery, if you will. Yes, platform sandals and gauzy blouses get my heart in a tizzy, but after the thrill of neon brights and florals wears off, you’re just left with a few flimsy pieces. 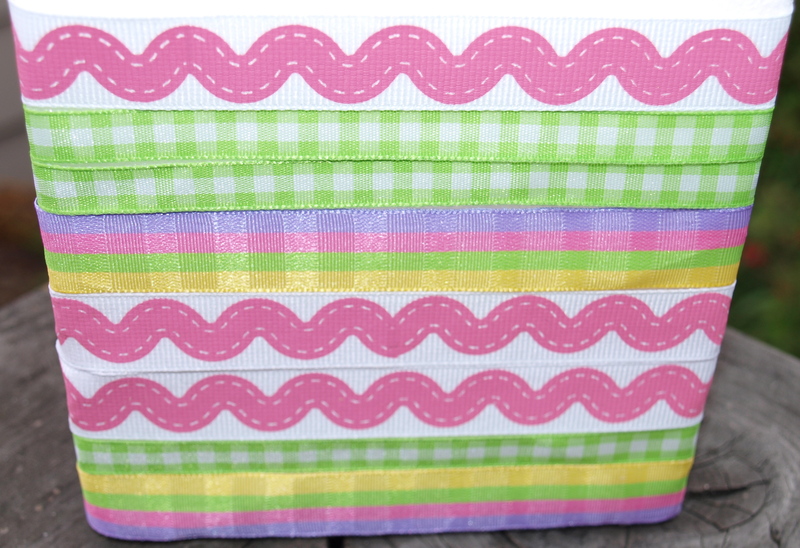 The same it was – I thought – for spring and summer crafting and baking. I never thought I would say this, but I think Spring may be nudging out Fall as my favorite season. Maybe having kids has gotten me all soft. But it seems that my yearning for mellow autumn days of melancholy sunlight and the chill of winter solitude has been replaced by a fondness for chirpy chicks, fuzzy bunnies, bright pastels and the zippity-do-da of Spring. Could it be that I’m ready to drop my teen angst at the ripe old age of 35? 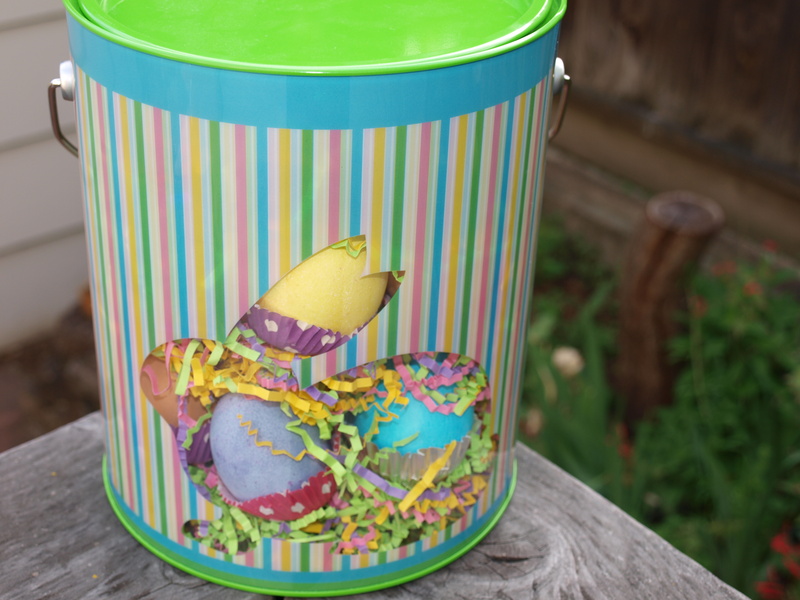 With peppy springtime projects like candy-filled eggs, confetti cake pops, painted puppet boxes, sprinkled cookies and paper mache eggs, I just might be. 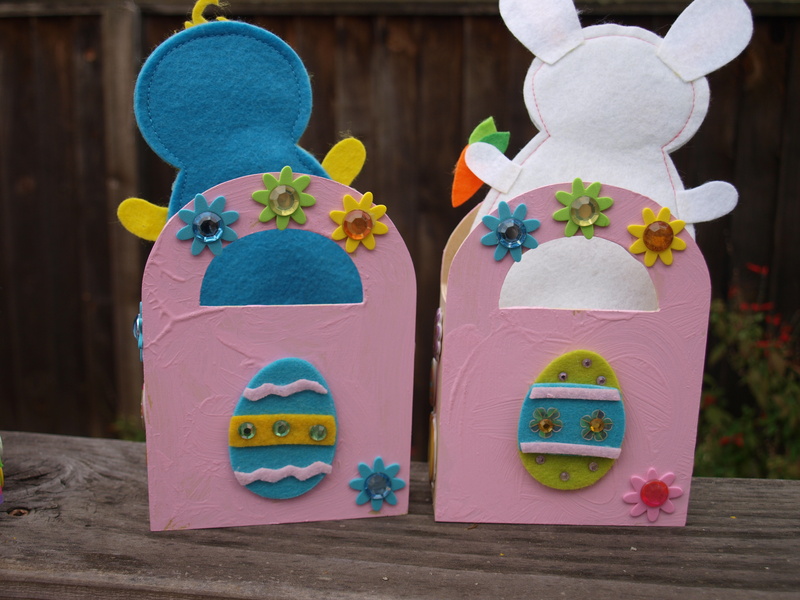 All the cracking, bashing and crunching made these by far and away the most exciting springtime activity for the kids! They also make a gorgeous hostess gift, too. 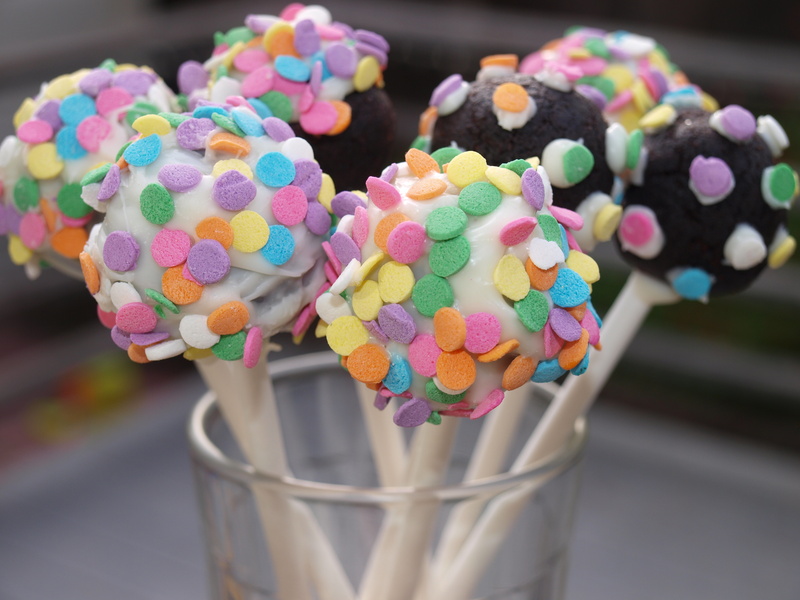 Since my first shot at the cake pop, I’ve been busy trying to perfect my technique. 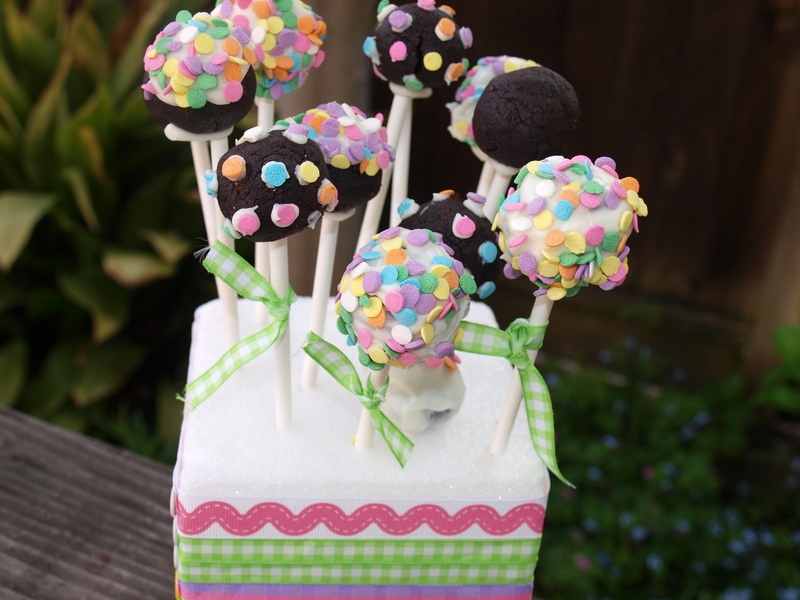 I took my own advice on this attempt and chose white candy melts to make the spring confetti really pop. The lifesaver this time around: disposable candy melt bags. 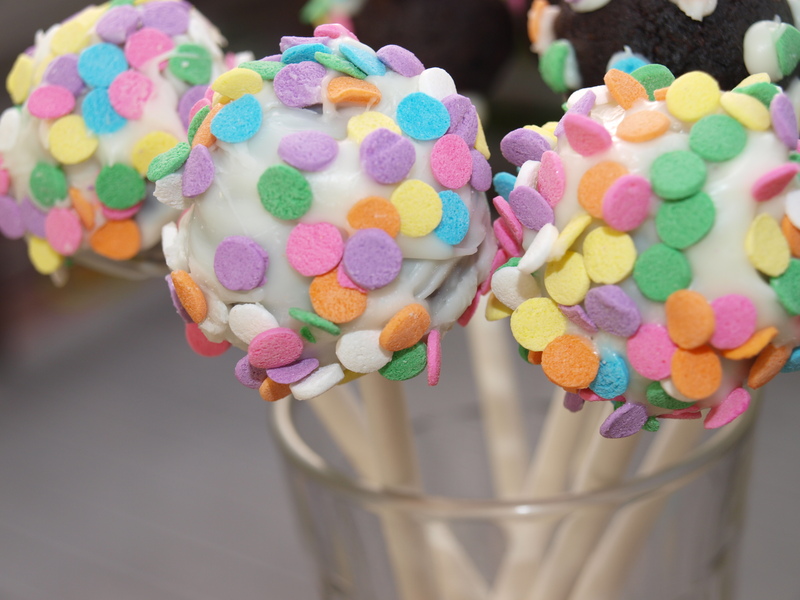 I’m never making cake pops again without this handy dandy device! 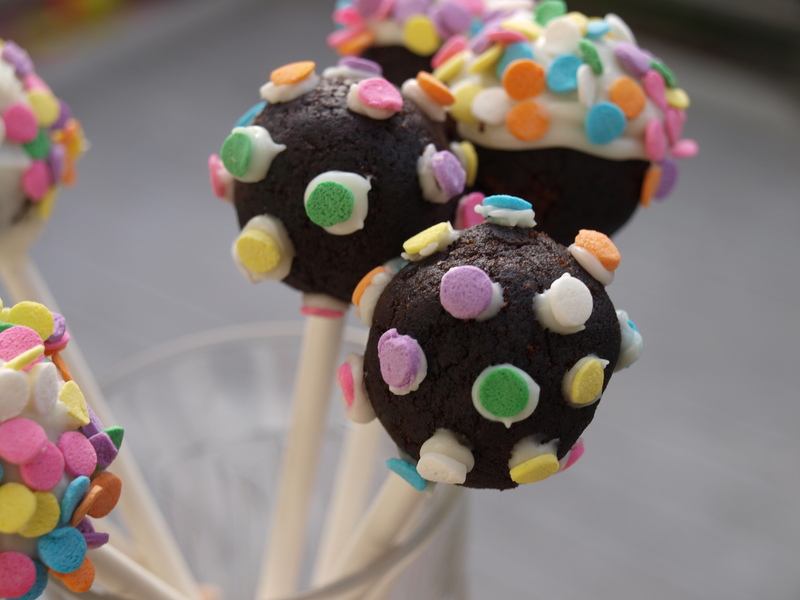 You can melt and decorate so easily and with virtually no mess. The double-boiler method would still probably give you the best results because it keeps the candy melts at an even temperature for a prolonged period of time, but my life is all about shortcuts these days. These were a birthday gift for a friend, so I needed a portable presentation. 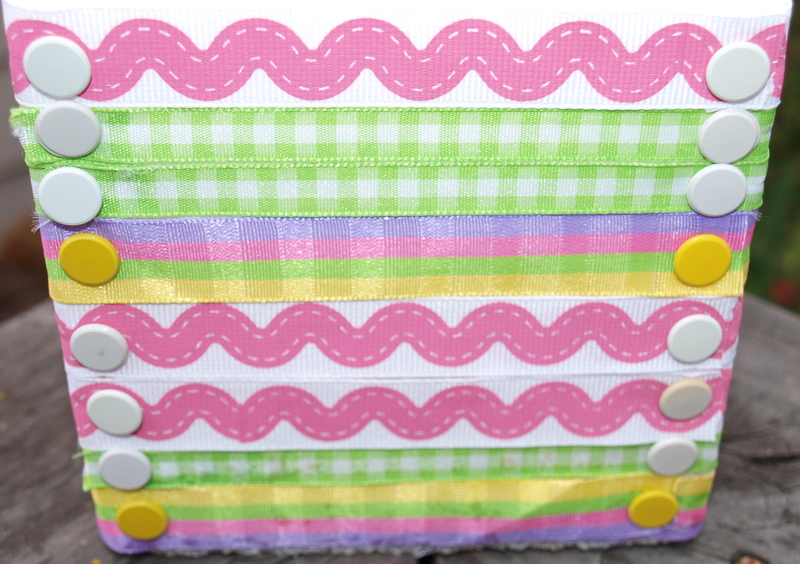 A beribboned styrofoam block (using colored tacks) worked out perfectly. 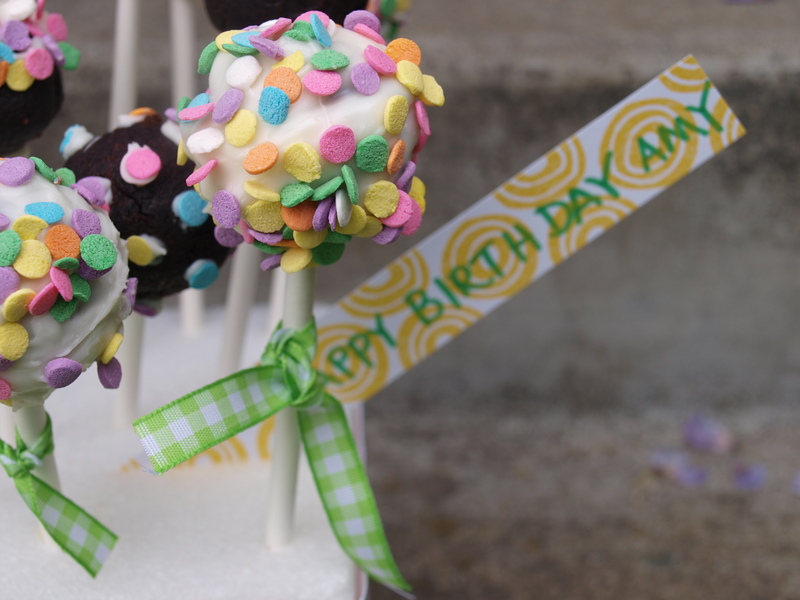 A few tied ribbons on the cake pop sticks and a rectangular piece of cardstock used as a gift tag completed the present. 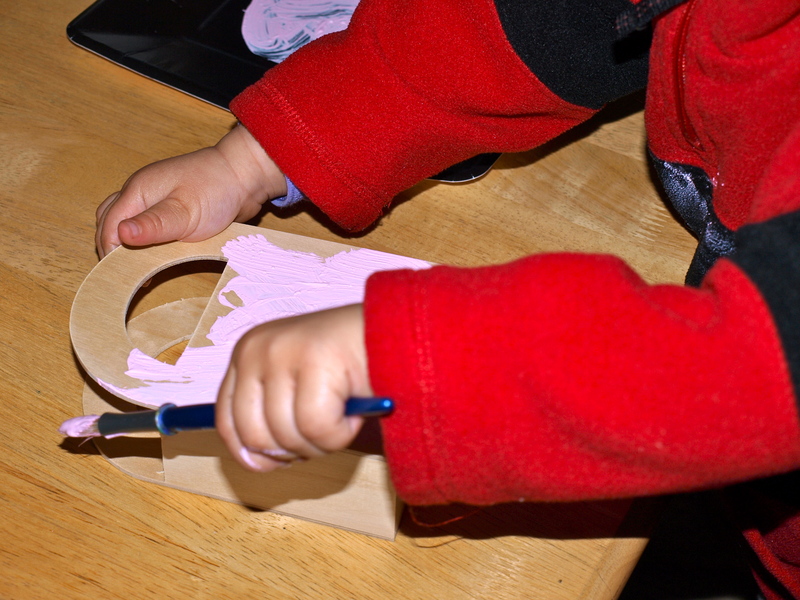 First, have your toddler paint the undecorated wooden baskets. Let the paint dry overnight. 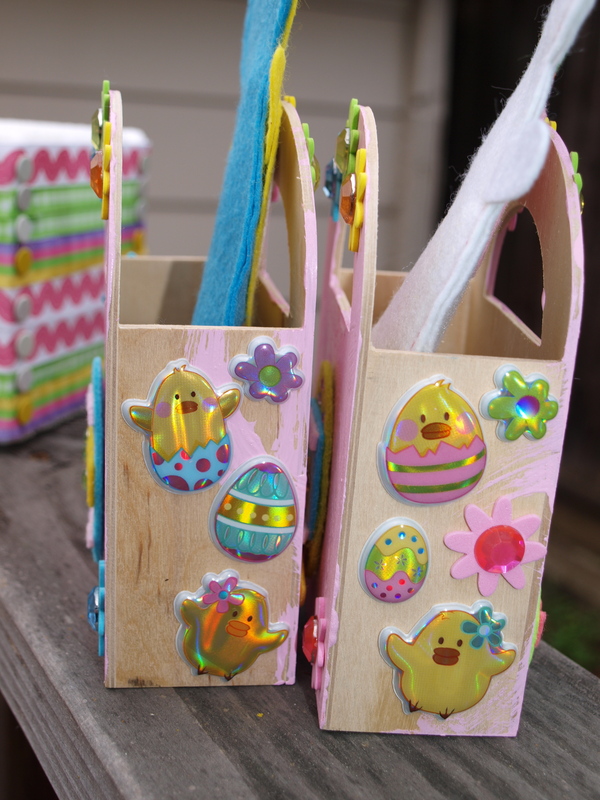 Then, decorate the painted boxes with stickers. 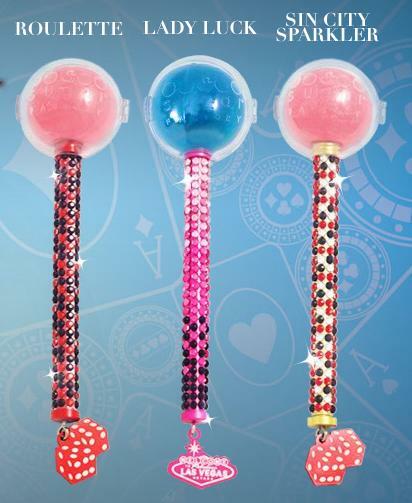 Finally, make your felt puppets or take your store bought ones and prop them up on a lollipop stick. The easiest gift and super cute, too! 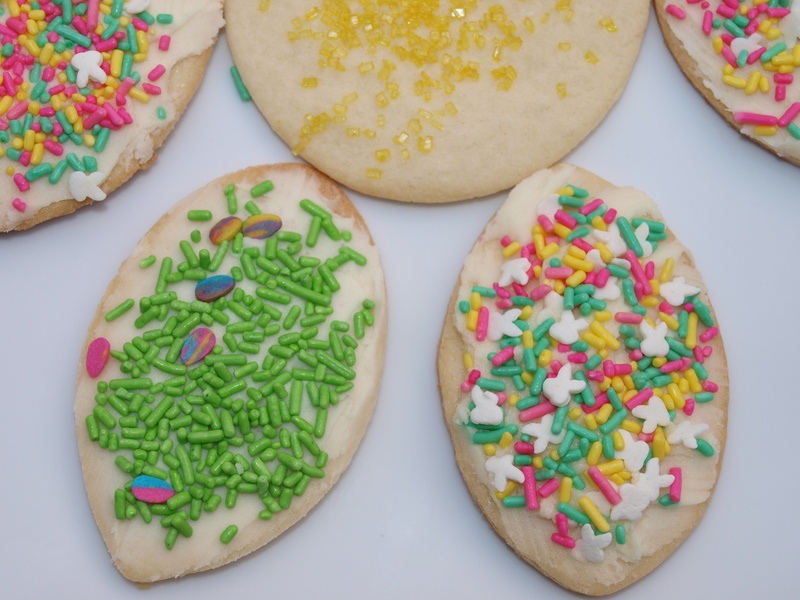 These hard, cardboard-tasting “Ideal Sugar Cookies” were a total bust! A little embarrassing because I gifted these to one of my friends, but it’s the thought that counts, isn’t it? And they’re oh-so-pretty to look at. The recipe was fine, but I doubled the butter and then tried to correct it by adding more of all the other ingredients and it just didn’t work. Of course, I used my favorite buttercream frosting, so licking off the sprinkled frosting was delicious! 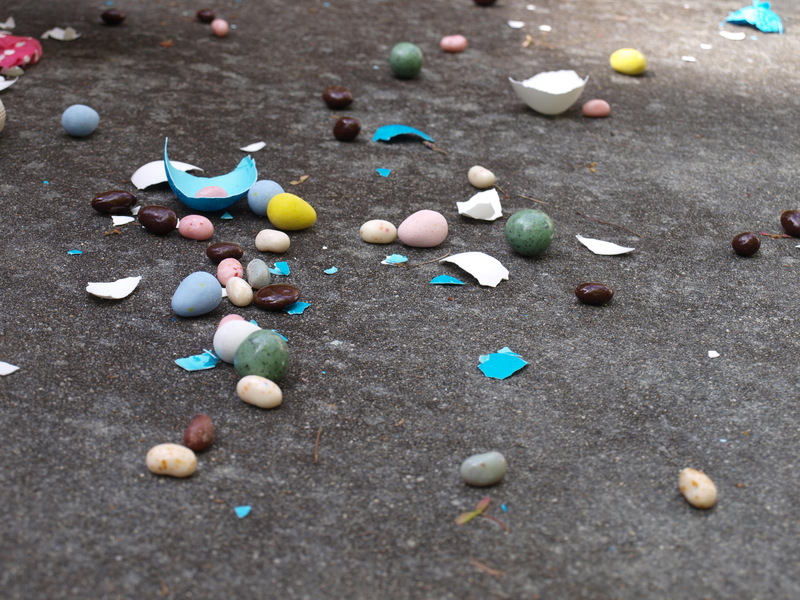 This is one project I couldn’t finish in time for Easter, but now that we have literally dozens of plastic Easter eggs littering our living room floor, I’m going to continue with the project anyway. I only got so far as one egg, but the results are very cool. 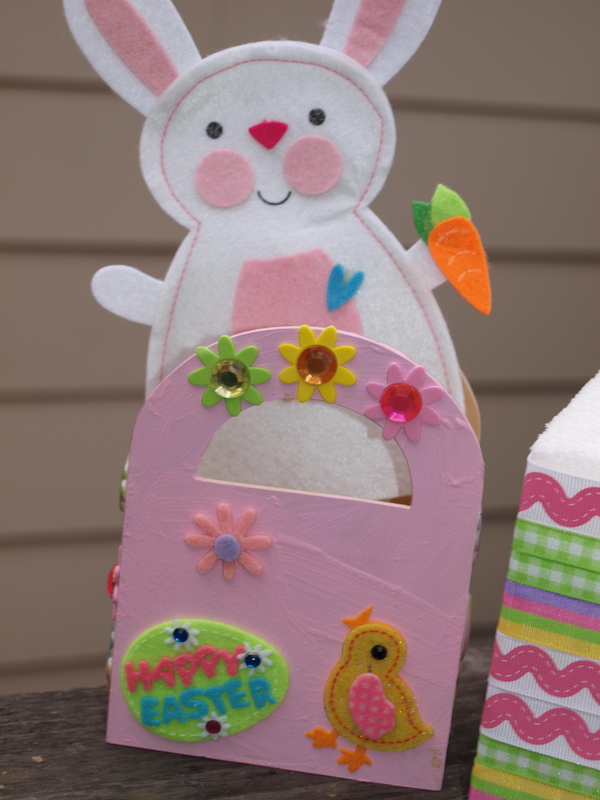 Check out Sweeter than Sweets’ Tissue Paper Easter Eggs tutorial here. 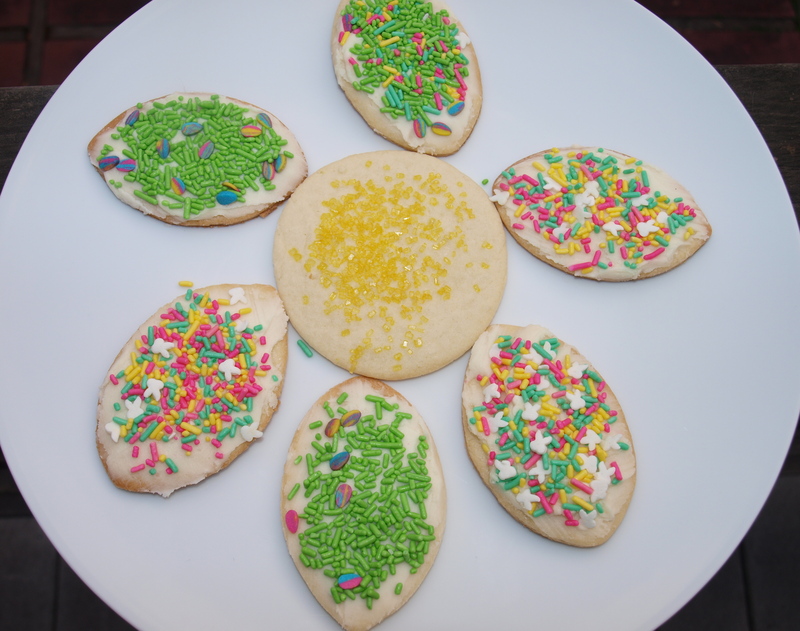 Happy Spring baking and crafting! And speaking of pops . . .
Drooling isn’t just for babies. 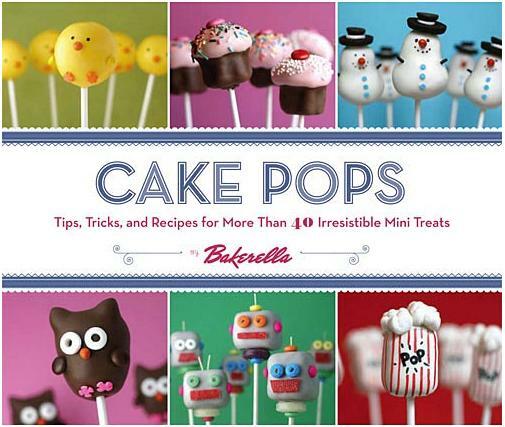 Get the book here for $11.29 and the pops here starting at $25 each. 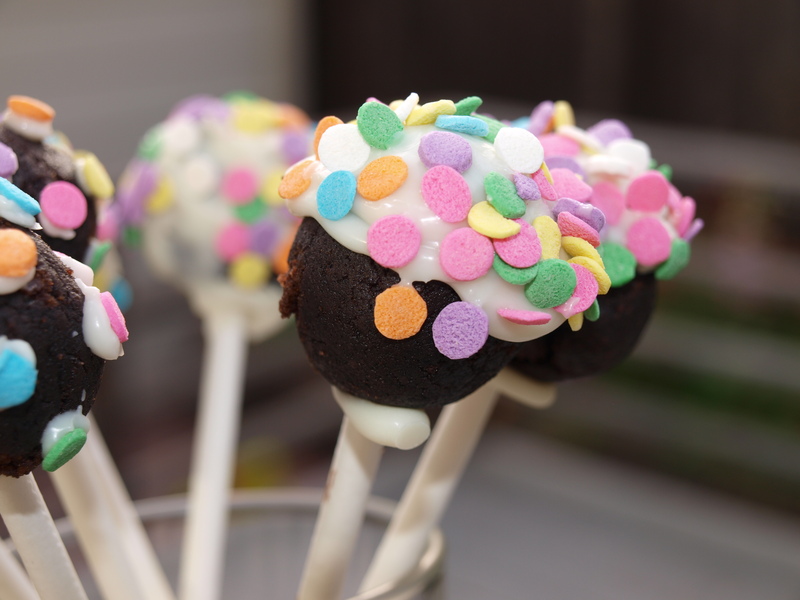 (Images from Bakerella and The Sugar Factory).